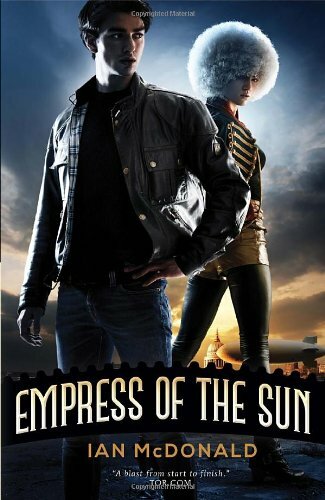 Starting from its in media res opening paragraphs, in which a multiverse-traveling steampunk dirigible crashes into the forest of a gigantic constructed disk world, Empress of the Sun revels in its pulp adventure milieu. 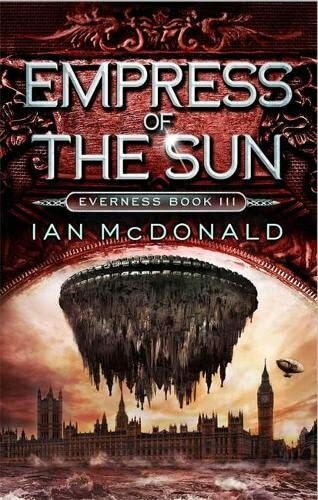 The third book in Ian McDonald's Everness YA series rarely stops for breath, much less for retrospective catching up, so readers are advised to read the series in order rather than jumping into the middle. McDonald has created an incredibly “storyable” universe for his characters to have their adventures in, and he keeps those adventures coming fast and furious. Planesrunner (2011) and Be My Enemy (2012) tell the story of Everett Singh, whose father created a device that allows access to all the parallel universes of the multiverse and was then promptly kidnapped. He left the "Infundibulum" (what a wonderful name for a MacGuffin) on Everett's iPad, which instantly drew him into the intrigue. By the third volume Everett has found a place on the steam dirigible Everness (lending the series its title), left his mother and baby sister behind, fought an alternate world version of himself, and come up against the villainess Charlotte Villiers. Now, in book three, Everett has made a major mistake and caused the Everness to shipwreck. He thought he was plotting a simple multiverse jump from one spherical Earth to another (a reasonable assumption), but it turns out that this universe has an Alderson disk where the Earth should be—a disk world made of most of the matter in the solar system with a hole in the center where the sun moves up and down, illuminating both sides of the disk. And it's inhabited by a society of dinosaurs who were not wiped out by an asteroid 65 million years ago, known as the Jiju. In the other plot threads, Charlotte Villiers figures out where Everett's gone and the tremendous risk posed by the Jiju possibly getting their hands on the Infundibulum. She works within the politics of the Praesidium of the Plenitude of Known Worlds (so far there are ten Earths in this network, including our own Earth 10) to both thwart Everett and also neutralize the Jiju threat. Back on our Earth, the Earth 3 alter of Everett (always referred to as Everett M—a nice homage to Iain M. Banks) is trying to inhabit our Everett's old life while also protecting the world from the threat of the Nahn—a black goo hive mind that rendered Earth 1 completely uninhabitable. As this summary shows, the multiverse of the Everness series enables just about any story that an author is capable of imagining. Between the nanotech abominations of Earth 1, the alien Thryn who inhabit another Earth and give Everett M a number of weaponized biotech implants, the constantly warring Jiju and their solar-system-scale engineering, the oil-lacking Steampunk world of the Everness airship—the only limit to this series's adventures is McDonald's imagination. Even the interactions between alters have endless variations—some of Charlotte Villiers's alters are male, or twins, or other incarnations, much more different from the original than you'd expect. Of course, pulp adventure plots are nothing without the life and soul breathed into them by their characters, and this is where Everett and the crew of the Everness earn their keep. Like so much YA fiction, fundamentally this series is about a hero leaving behind the family he was born into and finding a place for himself in the world, creating a new family among the people he finds along the way. Everett met the crew of the Everness in book one, solidified his place among them in book two, and finds that place jeopardized when he causes the shipwreck at the beginning of book three. He worries that he has lost all the love and respect that he's earned from Captain Anastasia Sixsmyth and her adopted daughter Sen, from the engineer Mchynlyth, and from the weighmaster Sharkey. It takes most of the book for Everett to convince himself that he can be forgiven for not being perfect all the time. At the same time, Everett M is finding his own place in Everett's world. Among more mundane surroundings he gradually warms to Everett's original best friend Ryun and also the ostentatiously quirky Noomi, who flirts mercilessly with him. Although as befits any hero he is reluctant to bring his troubles to his friends, he eventually enlists them into helping combat the Nahn threat. And he starts to come to terms with the life that has been thrust upon him (Charlotte Villiers is holding his "real" Earth 3 family more or less hostage) and make it his own. And what families they build! Crossing worlds, genders, sexualities, and ethnicities, the groups cohere based on the strong personalities within them. Captain Anastasia of the Everness forms the core of her group of disparate rogues. Everyone has a story, from the alternate-Bible quoting Sharkey (whose backstory, when it comes, is told with some beautifully old-fashioned purple prose) to the ex-Royal Navy airman Mchynlyth, and the teenaged white-Afro-ed Sen (seen on the mercifully un-whitewashed cover of the Pyr edition) who is just as mixed up and confused as Everett. In a scene late in the book, Sen and Everett, who would naturally be the romantic leads of such a story being the two teenage opposite-gender protagonists, get their signals quite crossed in an intimate moment. The genuine hurt and confusion and the way they're able to nonetheless recover is a quiet but powerful statement about the way relationships can develop. A similar dynamic exists between playing-it-super-cool Noomi and confused-but-trying-to-match-the-coolness Everett M back on Earth 10, where their miscommunications are painfully understandable, but can also be worked through eventually. These people are not doomed to be inscrutable mysteries to each other forever, and neither are Sen or Noomi prizes to be won once the heroes have conquered the plot. Between the adventures, the pacing, the characters, and the narrative arcs, there's a lot to enjoy about this book and the overall series. If there's one flaw to this book, it's the weight given to the heroes' journeys compared to the adventure plots they navigate. In any adventure narrative, perilous matters of life and death lurk at the end of almost every chapter. And in a story world with such epic scope, a massively multiple genocidal body count is an unpleasant result—when gigantic SFnal worlds collide, billions of lives are on the line. Yet those bodies seem to weigh little compared to the Everetts' navigation of interpersonal relationships. It's understandable that McDonald would want to strike this balance, but it seems almost devastatingly cold to not give those corpses the respect they could be due, keeping them instead off-stage so as not to discomfit the reader too much. On the other hand, the denouement of Empress seems to breathe new life into the villainess Charlotte Villiers, who spends most of the book off-stage, working behind the scenes, so that there could be more meaningful wrestling with good and evil in the future for Everett, Everett M, and the crew of the Everness . Karen Burnham is vocationally an engineer at NASA's Johnson Space Center, and avocationally a speculative fiction reviewer. She edits the Locus Roundtable blog, and she can be emailed at karen.burnham@gmail.com. "Infundibulum" seems a direct reference to Kurt Vonnegut. In the science fiction novel The Sirens of Titan by Kurt Vonnegut, a "chronosynclastic infundibulum" is a kind of wormhole through time and space, defined as "where all the different kinds of truths fit together". Is indeed a direct reference. See, for instance, this 2012 interview with McDonald. When asked where he got the name from, he replies "It’s Kurt Vonnegut, isn’t it?"